Freshwater springs are the ultimate year round Florida attraction, and we’ve got more of these crystal-clear natural wonders than any other place in the country. According to VisitFlorida.com, the highest concentration of natural springs in Florida is in the north and central regions, making it super simple to create your own personalized trip, depending on your schedule and how much you’ve previously traveled in the area. I have my own favorite springs… the Warm Mineral Springs in North Port, just south of Venice on the Gulf Coast. 90% of those that float in these waters are from Eastern Europe. They pilgrimage to Florida to heal in these springs that are dubbed “The Fountain of Youth”. Great for a weekend trip, The Warm Mineral Springs are 85 degrees year round. Over eight million gallons enter the swimming area every two hours. This natural resource is comprised of 51 minerals, which is the highest mineral content of any natural spring in the United States. The spring has been added to the U.S. National Register of Historic Places partly because it is one of the most important underwater archeological sites in America. During exploratory dives in the 1950s, several creatures were extracted from the spring, including saber tooth tigers, giant sloths, tortoises, and even camels. Today, with a goal of increased wellness for everyone, Warm Mineral Springs offers a natural experience to residents and visitors alike who want to soak in the warm waters. Learn more at www.cityofnorthport. com/visitors/visit-north-port/ warm-mineral-springs. Featured on the cover of this month’s Happy Herald is Devil’s Den Spring! Purchased in 1993 by the current owners, this natural wonder has been transformed from a simple scuba diving site into a world-class tourist attraction, and is another one of North America’s most prehistoric places. This underground spring, inside a dry cave, has been home to many extinct animals’ fossils dating back to the Pleistocene Age, which are on display at The University of Florida’s Museum of Natural History. At Devil’s Den Spring you can snorkel and scuba dive. Instructors are onsite and lodging is available. Learn more at: www.devilsden. com. Located just 15 minutes south of Tallahassee, Wakulla Springs State Park is the perfect northern anchor for a road trip exploring springs in North Florida. This is the deepest freshwater spring in the world. History, nature and film buffs: If the scenery looks like something from a Tarzan movie, that’s because it is. Wakulla Springs is the location of many Hollywood classics, including Creature from the Black Lagoon. Take the famous river cruise while you’re there, too. Learn more at www.floridastateparks. org/park/Wakulla-Springs. If you’ve been in Florida for any length of time, this is probably the spring your parents told you about. While there are several places around the state where you can take a tube trip, the Ichetucknee River rules them all. It’s a no-frills, easygoing adventure that can be enjoyed by all, whether you’re 8 or 80. While there, hang out at the headsprings and take the half-mile trail to Blue Hole Spring, another outstanding gem located in the park. This is Old Florida at its finest, and one of the best springs in North Florida. See more at www.floridastateparks.org/ park/Ichetucknee-Springs. The next three stops happen right along scenic U.S. 19 along Florida’s Nature Coast. Make a stop at Fanning Springs State Park for a relaxing afternoon of swimming and picnicking. See more at www.floridastateparks.org/ park/Fanning-Springs If you have a kayak, make sure to bring it along – Fanning Springs feeds the legendary Suwannee River, so you’ll definitely want to spend some time paddling while you’re there . 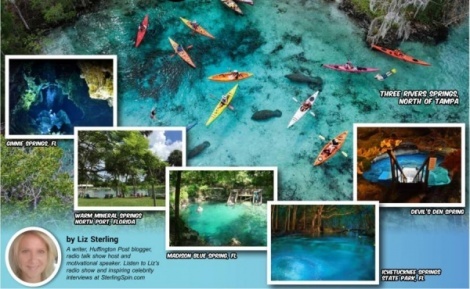 Alternatively, Manatee Springs State Park is located just a few miles north of Fanning Springs in Chiefland, so you have a couple of great options in this area. For the grand finale – or a grand start if you’re beginning your trip in the south – you’ll be greeted by the world-famous mermaids who have made Weeki Wachee Springs State Park beloved by visitors from around the globe. The mermaids have been delighting guests since 1947, and the tradition continues during several regular performances, 365 days a year. Also, in the summer months, hang out at the park’s Buccaneer Bay attraction, with water slides and a white sandy beach that’s perfect for getting the ultimate Florida tan. Round out the whole experience with a kayak trip on the Weeki Wachee River, one of the most scenic paddling trips found anywhere. No equipment needed – just head over to Paddling Adventures, the park’s outfitter, and if you swim, snorkel or scuba your way through summer, make every moment count, and be happy for all your adventures! See more at weekiwachee.com. Warm wishes from The Team at Happy Herald!